Hello, I am David Andersson, and welcome to the weapon guide for the QBB LSW Light Machine Gun which is unlocked as soon as you unlock create-a-class. Remember to leave a comment on the video with your favorite class setup for the QBB LSW, more details at the end of the post. The QBB LSW is the second light machine gun you unlock in Black Ops 2. It has the fastest handling characteristics of any light machine gun in the game. It also has a high fire rate, but at the cost of lower damage and the least range. When using the QBB LSW you can be more aggressive than with other light machine guns. The ADS time is fairly quick and, with the addition of dexterity, you can even sprint under some circumstances. But you have to remember that you are using a light machine gun. Strafing isn’t going to be effective so you will have to use cover a lot more. It is also a bad idea to sprint around corners since the hip fire of the QBB LSW, whilst being better than other light machine guns due to the higher fire rate, still doesn’t match anything but sniper rifles. The perks I found most useful with the QBB LSW were lightweight, flak jacket, toughness and dexterity. Lightweight will help you move around and lift some of the movement penalties that light machine guns get. Flak jacket will ensure that enemies can’t easily get you out of defensive positions with explosives. Toughness is essential, especially at long range, since you will easily miss your target whilst affected by flinching. Since you can be more aggressive with the QBB LSW dexterity will help you out should you be surprised by an enemy. I recommend you use a secondary since the reload time of the QBB LSW is fairly long. Switch to the secondary if somebody catches you reloading. The fore grip makes it easier to control the QBB LSW under sustained fire. I found that it was easy enough to deal with the QBB LSW’s recoil without the fore grip, at least at anything up to medium range. At long range the fore grip can help you out, at least a little. FMJ is useful on some maps, like Hijacked, in which you can penetrate a lot of walls. However, on other maps it isn’t as useful. What I also found is that it is easier to shoot through enemies to hit multiple targets with one bullet whilst using FMJ which is useful if you are facing a group of enemies. The stock makes strafing better by increasing the movement speed whilst aiming to normal walking speed. For LMGs that isn’t that useful since the walking speed is already slow. That said, with the stock you can walk with the sights up if you know an enemy is around a corner which can help you win gun fights since you are ready for one. The laser sight lets you fire from the hip with more accuracy. Since the QBB LSW has a high fire rate firing from the hip with the laser sight can be effective, especially if enemies are close to you, but generally speaking it is better to aim down the sights to ensure all bullets reach your intended target. Extended clip increases the bullets per magazine. I usually found that extended clip just delays the time when I reload. Without it I would have just reloaded earlier. However, sometimes, when you face a lot of enemies, extended clip can help you take care of all of them. Rapid fire is a fun attachment to the QBB LSW but the higher fire rate costs you dearly in range and controlability. The QBB LSW has seven optical attachments available. Personally, I prefer the iron sights. But if you are new to Call of Duty or have a hard time to aim the EDTech or reflex sight may help you out. If you sit far away from your screen or it is fairly small using any of the other optical attachments can help you out. But it is always best not to use an optical attachment since instead you could be using something that makes the weapon better. The QBB LSW has fast handling characteristics. To enhance those use quickdraw which will help you move around at a faster pace since you can react to enemies quicker. Since the QBB LSW has low damage but a high fire rate it is well suited to using a suppressor since the reduced range only has a limited impact. So there you go. 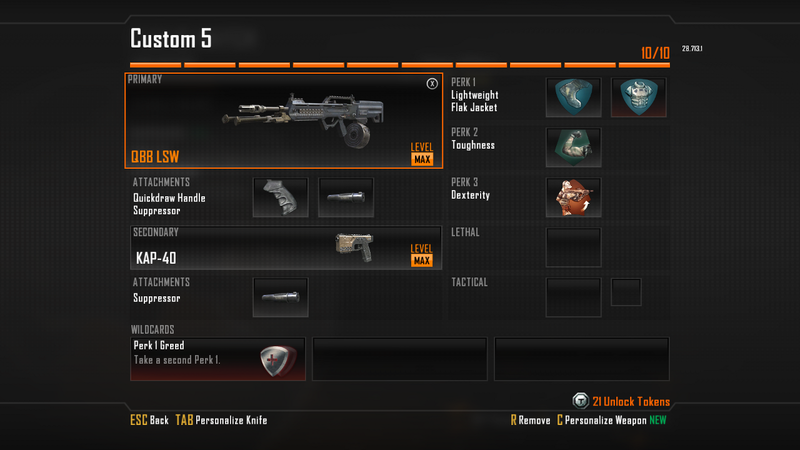 That is my preferred class setup with the QBB LSW. Leave a comment on the video with your favorite class setup with the QBB LSW for a chance to be featured on next Wednesday’s feedback video where I take a look at the classes you like and give you some opinions on them. This entry was posted in CoD: Black Ops 2, Weapon Guide and tagged auluftwaffles, Best Attachments, best Class Setup, Best Perks, Best Strategy, Black Ops 2, Black Ops 2 Weapon Guide, Call of Duty, Call of Duty Black Ops 2, Call of Duty Black Ops 2 Weapon Guide, Call of Duty Weapon Guide, Class Setup, Games, gaming, guide, QBB LSW, QBB LSW Best Attachments, QBB LSW Best Class Setup, QBB LSW Best Perks, QBB LSW Best Strategy, QBB LSW Weapon Guide, video game guides, Video Games, Weapon Guide. Bookmark the permalink. As a beginner, often looking for articles on the web that could assistance me. Is not commonly the spot of blogs, but I’d like to say that this post actually pushed me this way! a fantastic place.